France boasts ultra-modern cities, historic destinations, charming villages, and traditional towns. The country is famous for food, fashion, culture, romance and style. There’s never a dull moment! With an abundance of awesome experiences, many visitors can feel overwhelmed when planning their French adventure. Of course, you want to cram in as much as possible. But time is likely limited. So, how can you maximise your vacation time in France and make sure you hit all the best bits? With these excellent recommendations of the best things to do in France, of course! Our expert team has worked hard to bring you the highlights of many places in France, helping to make your travel planning that much easier. Check out the top destinations in France and see a range of cool things to see and do in each place for a fantastic European holiday. Join a small group tour of the beautiful Palace of Versailles, a French historic jewel just a short drive outside of Paris. Your guide will fill you in on interesting facts about the palace and its troubled history. You can explore the elegant exteriors, including the Hall of Mirrors and State Apartments. Period furnishings help to transport you back to a regal age now long past. The palace is impressive from the outside too, and you’ll have plenty of time to wander through the glorious gardens and stately grounds. If Paris is the City of Love, the River Seine is a symbol of love. Board a classy boat for a scenic ride along the famous river, passing major landmarks like the Eiffel Tower, the Louvre, and Notre Dame Cathedral. You’ll pass under a number of elegant bridges and see various sights alongside the river. The city really lives up to its moniker of the City of Lights in the evening time, with beautiful reflections shimmering on the waters and twinkling lights in the distance. Lap up the views with your love and dine on tasty fare for a romantic evening in Paris. Upgrade to the Champagne option to make your three-course meal that bit more special. What child could resist the allure of Disneyland? With two terrific theme parks for heaps of family fun, there’s never a dull moment at Disneyland Paris. Enter a magical world of fairy tales at Disneyland Park and look out for all your favourite characters for cool selfies. There are rides for people of all ages and fabulous shows that will make everyone smile. Add themed eateries and gift shops and the fun just gets better! Experience movie making at Walt Disney Studios Park, with sets, props, and studios and look behind the scenes to learn just what goes into making magic for the big screen. The Champs Elysees is one of Paris’s most sophisticated streets. Linking the grand Place de la Concorde and Place Charles de Gaulle, the stylish street oozes class and luxury. It is lined with high-end boutiques and stores, theatres, and charming cafes. While shopping along this famous road will certainly set you back a pretty penny (or euro! ), taking a stroll along one of the world’s most luxurious avenues won’t cost a thing. Peer at attractive displays, enjoy striking architecture and feel fancy without splashing the cash. While Paris has many fancy restaurants, bars, and discotheques, seeing a captivating show is perhaps one of the best ways to spend an evening in the French capital. With shows to suit all tastes in a variety of venues, everyone will find something to tickle their fancy. The “Paris Merveilles” show is especially recommended for people who want to sample a slice of Parisian sexiness and sauciness. Featuring extravagant costumes, brilliantly choreographed routines, skilled dancers, and stirring music, it’s one of the best cabaret shows in the city. It’s held in a marvellous setting too, within the Lido, one of the most sought-after theatres along the famous Champs Elysees. And, that’s not all—your evening will also include a sumptuous dinner prepared by an esteemed chef. Here’s a few handy guides to help you on your Parisian getaway! Hit the highlights of Bordeaux on a fun and friendly cycling tour of the UNESCO-listed city. Helmets are provided and a guide accompanies you on the route. As well as providing interesting information, your guide will also give you terrific tips on the best places to eat, favourite hangout spots for locals, and how to make the most of your stay in Bordeaux. The ride is fairly easy and flat with plenty of stops – so no need to worry about not being able to keep up! Ride alongside the attractive Garonne River and discover both the old and new parts of Bordeaux. Bordeaux is known for being one of France’s best wine-growing areas, and a trip to the countryside is a fabulous way to enjoy time with that special someone. Visit glorious chateaux, sample delicious locally produced wines, admire stunning scenery, and taste delicious produce such as fresh breads, cheeses, and dried meats. Discover the picturesque Medoc area and learn about local wine-making traditions, all while making magical memories with your beloved. Most children love seeing animals from around the world, and Zoo de Bordeaux Pessac is home to an exciting array of creatures. Animals include lions, tigers, giraffes, zebras, otters, cheetahs, gibbons, birds, and more. Keep an eye on the clock for feeding times and take little ones to the hands-on petting zoo for squeals of delight. You could even arrange for family members to be a zookeeper for a day. Watch birds of prey in flight and attend educational talks. The animal kingdom really is fascinating! Immerse yourself in local life with a walk through Bordeaux’s varied markets. From fresh produce to second-hand goods and speciality markets, Bordeaux has a wealth of goods displayed for sale. While we can’t promise that you won’t be tempted to part with some cash, simply walking around the market, looking, absorbing the energy, and snapping pictures is completely free. Marche des Capuchins is a bustling fresh fruit and vegetable market that attracts health-conscious locals. Le Marche des Grands Hommes mainly specialises in fresh cuts of meat and seafood. Bargain hunters are sure to love Marche Saint Michel and Marche des Bouquinistes, while the seasonal Christmas markets are full of joy and festive cheer. Set sail along the river from Richelieu Quay for a beautiful evening filled with pleasant views and fine food. The waterfront is especially enchanting in the evening when illuminated and you’ll rift by several attractive bridges, quays, and Place de la Bourse. Dig into a tasty meal, with dishes expertly prepared using fresh seasonal produce. You can also indulge in some wine tasting if you fancy. Take some time getting used to how a Segway operates before taking to the streets with a guide. Helmets are provided and the riding pace is easy. Cover more ground than you could walking and see many of Marseilles beautiful buildings and landmarks. The trip leads you past places like Notre Dame de la Garde, from where you can also enjoy panoramic city views, the Old Port, and Cathedrale de la Major. Visit two of the most picturesque villages in France: Gordes and Roussillon. Take your lover’s hand and walk around the pretty villages, admiring the gorgeous architecture and terrific views. Each village is perched on a cliff top. Additionally, the trip includes spectacular lavender fields. Inhale the soothing aromas and feast your eyes on a beautiful blanket of purple spread out before you. You’ll certainly get many great photos to remind you of your romantic time in rural France! Enjoy lunch (at your own expense) in the lovely village of Sault too, savouring traditional French foods. he onboard commentary (available in several languages) gives heaps of info about the city and the constantly changing views as you drive along will keep everyone engaged. Stops include Notre Dame de la Garde, Victor Abby, the Old Port, Joliette, Catalans, and the fishing harbour of Vallon des Auffes. Parc Longchamp is a nice place to unwind. Whether you’re visiting Marseilles with your significant other, family, friends, or as a lone explorer, take time out to stroll through the interesting park—you’ll come across some unusual sights! The park was formerly home to a zoo. The animals have long moved out and the zoo was left to decay. However, a novel initiative has seen replica animals placed in the original cages! You can also enjoy the views of the elegant Longchamp Palace, a 19th-century beauty. Visiting the park is free and it’s one of Marseilles most unique places. There are many top-class places to eat and drink in Marseilles, but for a night that offers more excitement and variety, why not buy tickets to one of the many awesome shows? There are many theatres and event venues around the city with a diverse program of events to suit almost any taste. Want to laugh your socks off? Watch stand-up comedians at the chilled out La Quai du Rire. If extravagant and energetic cabaret is more up your street, check out Tatie Theatre. Odeon Theatre is a great place for an array of performed arts, from plays and ballets to musical recitals and stirring operatic performances. Here’s a complete guide to 15 stellar things to do in Marseille, plus the 17 best hotels in Marseille and a complete neighborhood guide so you can plan your trip with ease! Let Lyon capture your heart and imagination through a terrific gastronomic walking tour of the city. Work up a hunger as you amble past stunning buildings, remnants from a bourgeois age and a time of opulent grandeur. Be amazed as your guide leads you through secret courtyards and hidden corridors that discretely cut through buildings. You’ll make plenty of stops to sample local fare and keep hunger firmly at bay; delight in locally made wines, cheeses, breads, meats, and more, and don’t miss trying a tasty praline pastry. It’s a local favourite! If you just can’t get enough of Lyon’s moreish food, how about joining a cooking class at the end of the tour to learn how to recreate Lyonnais delicacies back at home to blow your friends away? Boat rides always have something a little romantic about them, and sailing along the scenic River Saone in Lyon with your sweetheart is no exception. See where the Saone meets the River Rhine and soak up waterside scenes. Ile Barbe is a picturesque sight, home to a historic monastery. Former artisan homes line the river, and you can see where skilled silk weavers used to perfect their craft. Get a different perspective of Lyon as you relax and drift past beautiful Renaissance buildings and the contrasting remnants of the industrial area. Mini World is a fabulous place for old and young alike with plenty to capture your attention and imagination. Built with care, skill, precision, and flair, it’s the biggest animated mini world in all of France. The tiny scenes would be super impressive in their own right, but life is really breathed into the models by the huge amount of moving features. You might not know where to look first! You’ll definitely feel gigantic as you tower over famous landmarks and cool exhibitions! Little ones can have fun hunting for Waldo too. Although not free per se (as you will need to pay for the pass), the Lyon City Card can make your time in the city much cheaper and arguably more action-packed. Knowing that certain attractions are free will almost certainly inspire you to visit as much as possible and really maximise your time in Lyon. The card includes a whopping 22 museums, all free to enjoy. Covering a variety of themes, you could spend weeks exploring Lyon’s museums and never feel bored. Examples include the African Museum, the Fine Arts Museum of Lyon, the Electricity Museum, and the Gallo Roman Museum of St Roman en Gal. You can also ride public transportation for free with your pass. A number of other attractions and activities are also included and there are further discounts and perks at many other places too. You’ve seen Lyon by day, but the nighttime city views are equally as beautiful. Lyon takes on a whole new glow in the dark when its rivers and buildings are beautifully illuminated. Rather than just walking around, though, add in the fun factor (and, save your tired legs!) and glide around on a Segway. Don’t worry—you’ll be given training and practice time before taking to the streets! Visit the confluence of the rivers Rhine and Saone and admire the floodlit Musee des Confluences. Compare and contrast graceful Renaissance buildings from yesteryear with more modern buildings and regenerated industrial areas. There’s plenty to see on your Segway tour of Lyon by night. Lyon has so much to do and things to see. Here’s a complete guide to 14 coolest things to do in Lyon, plus a neighborhood guide to where to stay in Lyon, and the 17 best hotels in lyon so that you can find the perfect hotel at the best price for you! Sit back, take a load off, relax, and see the sights of Strasbourg unfold from the back of a pedicab. It’s definitely a bit different to the norm and adds an exciting twist to your sightseeing. Hear interesting stories and local tidbits about the city, which is home to the Council of Europe and the European Parliament. Your friendly driver will also give you heaps of useful tips for how to enjoy your time in Strasbourg and you can pick their brains if there’s anything you want to find out. Soak up the views as you pass through the historic area of Petite France, admire the attractive facades around the Place de la Republique, see splendid EU buildings at the European Quarter, and more. Highlights include Strasbourg Minster, the weir of Barrage Vauban, Rohan Palace, and ARTE television’s building. Take a day excursion out of the city to uncover the scenic gems around stunning Alsace. You’ll likely notice the German influences too, with the blend of cultures coming together in an interesting and rather unique manner. Who could resist trying locally made wines too? Begin your day in the Mittelbergheim area, calling into wineries to sample tasty wines. You’ll then continue to another delightful wine-producing village: Dambach La Ville. Enjoy lunch before visiting the picture-perfect towns of Ribeauvillé and Riquewihr. Feel as though you’ve jumped back to the Middle Ages as you wander medieval streets and visit even more traditional family-run wineries. Found in front of the splendid Palace of Europe, Orangerie Park is Strasbourg’s oldest and biggest park. There is lots of space for little ones to run, play, and burn off excess energy. There are several terrific play areas where younger members of the family can have fun and giggles and maybe spend time playing with new little friends. Get up close and personal with a range of animals at the free zoo and petting farm, chill out alongside the sparkling lake, and look out for the many storks that call the park home. The stork is the city’s symbol so be sure to snap a picture or two. If you’re planning to spend a fair amount of time out and about why not pack a picnic and enjoy a spot of al fresco lunch in pretty surroundings and fresh air? Petite France is one of Strasbourg’s most charming areas. It’s a place where you can feel as though you’ve stepped back in time as you walk along the medieval streets, passing former slaughterhouses and tanning houses. The quaint homes look like they’ve been lifted right from the pages of a fairytale and there are many cute little streets and alleyways to lose yourself in. Stroll along the nearby promenade to enjoy waterside views, and stop for a while in the pleasant park. With a large student population, Strasbourg is lively and energetic as night descends. There are many bars, pubs, and clubs to enjoy into the wee small hours, and you’ll find different genres of music, vibes, and themes to suit any night owl. Some of Strasbourg’s most happening nightspots can be found along Rue des Juifs and Rue des Freres and the streets around the cathedral and university are also lively come nightfall. The French Riviera is stunning no matter how you explore it, but wouldn’t it be super cool to pop the top down on a sleek Ferrari F430 F1 Spider and feel the wind against your face as you roar along the coast? Stop dreaming and start doing! Join your friendly co-pilot for a thrilling ride around Nice, including the Corniche, Promenade des Anglais, and coastal roads. If you prefer to sit back and lose yourself in the moment you can travel as the passenger. The views are incredible and the buzz is out of this world. Biking around on an E bike is effortless—no achy legs or sore bottoms the next day! Ride alongside your partner for a fantastic sightseeing experience around Nice. You’ll take in some of the lovely city’s hotspots and famous sights, including the Old Town, Castle Hill, Saint Alban Fort, Cimiez Hill, and more. The route takes you past evocative Roman ruins, grand architectural beauties, pleasant gardens, atmospheric squares, and impressive monuments. There are also many stunning views to admire. Nice’s enviable position along the gorgeous French Riviera means that there are plenty of great beaches within easy reach. The warm and sunny climate makes days at the seaside appealing for people of all ages, and there are loads of ways for you and your children to have fun. Build a sandcastle, swim in the sea, try your hand at surfing, collect seashells, play Frisbee, start a game of beach volleyball, relax, read a book, enjoy an ice cream … the possibilities are endless! There’s a selection of public and private beaches, with some of Nice’s finest sandy shores including Castel Plage, Coco Beach, Ruhl Beach, and La Reserve. Don’t forget your bathing suits, towels, sunglasses, and sun cream! Nice has a picturesque Old Town where you can spend hours simply wandering around, lapping up the sights, and absorbing the energy. Take a break from the beaches and step back in time, seeing places like Sainte Reparate Cathedral, Avgdor Palace, the Palace of Justice, Garibaldi Square, and Cours Saleva. Don’t miss the splendid vistas along the Promenade des Anglais too. You can explore independently for free or, for an authentic local experience and the chance to uncover hidden gems, discover Nice with a friendly, knowledgeable and informative guide. Nice has many places to enjoy at nighttime, including trendy bars, fine restaurants, cosy pubs, cool live music joints, theatres, and cinemas. Nice is also home to many hip and laid-back cafes, which definitely bring something new to the nightlife. Take it easy and unwind in one of Nice’s delightful cafes and mingle with locals, expats, and tourists. Many cafes host interesting events on various nights of the week, such as poetry recitals, debates, open mics, jazz clubs, reading clubs, language exchanges, dance lessons, quizzes, movies, guest speakers, and more. 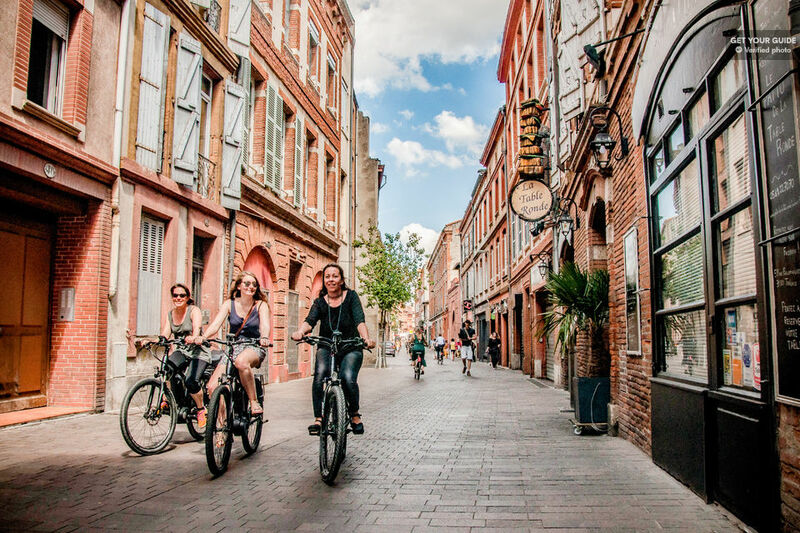 Take the burn out of cycling and discover Toulouse the easy way – by E bike. You’ll get around the sights much quicker and easier than if you were to walk, plus you’ll benefit from the insights of a local guide. Oh, and E bikes are good for the environment too, making them a much more eco-friendly option than taxis, cars, and buses! And, if you needed any more incentive, the bikes are really easy to ride too. Have tons of fun discovering the many charms of the village-like and historic Pink City. If pink is a colour of love, you and that special someone will certainly feel the passion and romance in Toulouse. Take time to admire the city’s stunning architecture, with many buildings in dusky tones of rose and pink. The Romanesque Basilica of Saint Sernin is huge and impressive. Dating back to the late 1000s, it contains many detailed religious statues and sculptures. The Gothic Church of the Jacobins has a long history as well as being visually appealing, and the marble exteriors of the Capitole de Toulouse are grand and photogenic. The mysteries of air and space travel are often fascinating for both older and younger members of the family. As the French centre of the aeronautics industry, Toulouse is a terrific destination for anyone interested in entering the fascinating worlds of flight and space explorations. Learn heaps about aviation at Aeroscopia and see a variety of cool flying machines. Pop by the Airbus Factory. And spend a fun-filled day at the space-themed attraction park of Cité de l’Espace. There are tons of fascinating displays and exhibits that take your mind into outer space and you can even see how satellites are launched into orbit! The Canal du Midi runs through Toulouse and it has the distinction of being one of the oldest still-working canals in all of Europe. Linking the Mediterranean Sea and the Garonne River, the scenic canal is surrounded by picturesque nature. Stroll along the water’s edge enjoying the natural vistas and the air of tranquillity, and spot a variety of wildlife, including birds and small mammals. Picnic along the banks of the canal or take a boat ride to admire the city in a different way. Toulouse has a large number of performing arts venues and the full and diverse schedule means there’s always something cool happening. It’s often said that Toulouse’s performing arts scene is good enough to rival, or at least draw equal with, that of the French capital! Check out the listings at Theatre du Capitole for classical French performances and operas, watch plays, cabarets, and musical events at theatre Garonne, and check out the classical music concerts at Halle aux Grains for a soulful night. Whether you’re into plays, musicals, dance, live concerts, comedy, classical performances, traditional shows, or something else entirely, Toulouse won’t disappoint. This trip around spectacular Provence really is a feast for the senses! Indulge in delectable local chocolates and wine as you travel through jaw-droppingly beautiful areas. Depart lovely Avignon and drive through pretty vineyards outside of Châteauneuf du Pape. In Orange, you’ll get to explore the UNESCO World Heritage ancient theatre from the Roman era. The Pont du Gard is another impressive legacy from the times when the mighty Romans ruled the lands. Uzes boasts an imposing military tower; climb to the top for awesome views. Art-loving couples will be in seventh heaven on this Van Gogh inspired excursion. It’s easy to see how the famous artist was inspired as you traverse picturesque landscapes and see incredible architecture from times gone by. You’ll begin your exploration of Provence in Arles, an attractive city that was particularly loved by Van Gogh. Look out for copies of his paintings strategically placed around the city. See Langlois Bridge, which featured in no fewer than Van Gogh’s pieces, and Saint-Paul de Mausole monastery, where Van Gogh created many masterpieces. The trip also includes the delightful village of Les Baux-de-Provence and an exciting sound and light show in a limestone cave. Immerse yourself in nature at Camargue National Park, an area filled with natural splendour, interesting wildlife, and historical legacies. Young minds will almost certainly be captured by the majesty of the mighty 13th-century fortress in Aigues-Mortes, and the scenic train ride is often a big hit with younger members of the family. Plus, you get to sit down, look out the window, and recharge your energy for a while! A ferry crossing across the River Rhone adds more diversity and you’ll also have the chance to swim in the sparkling sea waters at Saintes-Maries de la Mer. Go bird spotting in Arles and see an old Roman theatre. Get active and enjoy the great outdoors with a brisk walk up Avignon’s Hill of Mourgues. There are well-marked trails to follow, with small shrines and statues to catch your eye. Kids can cut loose in the play area and there are picnic areas where you can take a break and enjoy some refreshments. A small chapel, Notre-Dame de Consolation Chapel, sits on top of the hill and you can enjoy terrific views of the city below. Avignon has a number of great bars and clubs where you can party until the early hours of the morning. Dress up fancy and hit up some of the local wine bars, sipping on delicious wines produced not so far away. You may even become a connoisseur! Then, join the local in-crowd at Les Ambassadeurs, a trendy and sophisticated nightclub where people shake and shimmy on the dance floor to all the coolest tunes. Take a day to explore Corsica’s fabulous mountains and you certainly won’t be disappointed. Beautiful vistas await you around almost every corner, and there are historic and cultural experiences too. Traditional dry-stone walls line the narrow countryside roads and various crops grow in the fields. Cork trees grow in abundance. Refuel in Carbini Village before sampling local olive oils at a historic oil mill in Sainte-Lucie-de-Tallano. Enjoy a relaxed lunch break in Quenza before continuing along pretty mountain roads to reach Col de Bavella. Contrast the mountains with the coastal and lowland scenery as you return via pretty Zonza and Lake Ospedale. See Corsica from a different angle with a scenic boat trip around the coast. Mountains rise dramatically from the island’s interior and sandy beaches fringe the French island’s edges. There are plenty of fascinating rock formations too. You’ll travel through small inlets and can peer into caves that are inaccessible other than by boat. Travel with a small group for a more intimate and serene experience with your love. Corsica’s beaches are a primary draw for families, with kids of all ages (and adults!) finding plenty of ways to have fun on the sands and in the water. Paddle in the warm waters, have fun with inflatable toys or swim in the gentle waves. Take a bucket and spade for a sand sculpture competition! Don’t forget sun hats, sun cream, and plenty of water. Alternatively, check out the rocky coastal areas to forage in rock pools and snorkel just off the coast to spot an assortment of aquatic life. Bonifacio is an interesting city in the southern part of Corsica. It is often said to be one of the island’s best-kept secrets and it’s a top place for awe-inspiring views, history, and local life. Just a narrow channel of water separates the town from the Italian island of Sardinia. The aquamarine waters have huge volcanic rocks jutting up from the waves and several shipwrecks lie at the bottom of the sea. White limestone cliffs meet deep blue waters, topped by a striking medieval town. Walking around the town and soaking up the vibe is one of the best ways to spend a free day in Corsica. Corsica isn’t much of a night owl or party animal, so much evening entertainment revolves around the local eateries. Great news for foodies! Grab a table in an atmospheric restaurant and take your time to ponder the menu—with so many tempting meal options you’ll likely be spoilt for choice. Pop the cork on a bottle of French wine for the perfect complement to your delicious dinner. And, there you have it—the best things to do in France! From the north to the south and from the east to the west, you’ll find a plethora of things to see and do in France. There are beautiful sandy beaches, soaring mountains where you can enjoy an array of winter and summer sports, lush countryside with numerous vineyards, farms, and orchards, and other natural places of interest. France has something for foodies, fashionistas, shopaholics, history buffs, kids, couples, culture vultures, adventurers and party animals. France is beckoning! How many of these recommendations will you be ticking off on your next visit to the stunning European nation? Did you like this article? Here are more handy guides to help you plan your French getaway!